The biggest night in music is almost here! 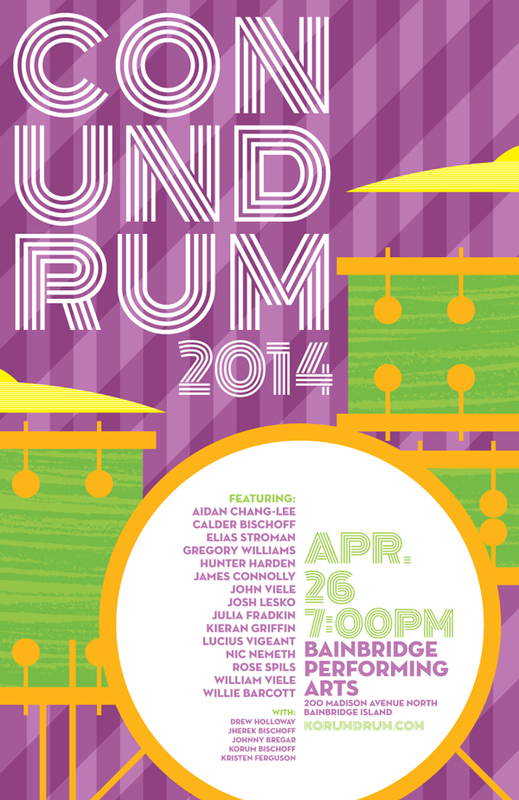 Come be completely inspired by the talent, passion and risk-taking of 16 adorable students as they rock their favorite songs accompanied by Jherek Bischoff, Johnny Bregar Music, Kristen Ferguson, and Drew Holloway on the stage at Bainbridge Performing Arts. FREE and GREAT FOR FAMILIES who don’t mind a little noise! Seriously, you won’t regret it! Be there! April 26, 2014. 7:00pm Bainbridge Performing Arts. Most of you know that my brother is becoming a big deal in the music biz. In fact, he has backed many of you or your kids at Conundrum at some point. Or maybe you backed his Kickstarter campaign for the big show in NYC last year with David Byrne. Anyhow, he’s bringing a scaled-down version of that show to Bainbridge Performing Arts this Friday, August 16. I’ll be joining him on percussion. There are still some seats left. I thought you might be interested in hearing what he has been up to, seeing me play non-kids music, or have an interest in quality music performances without having to cross the water. The music is chamber-oriented, and while appropriate for kids, might not exactly keep them excited. So, if you have older or really patient kids, bring them. Or have a night out on the town without them! The show is this Friday at 7:30. $20. Called a “pop polymath” by The New York Times and a “Seattle phenom” by The New Yorker, Jherek Bischoff returns to his hometown of Bainbridge Island for the first time since the release of his acclaimed orchestral record “Composed” (Feat. David Byrne, Caetano Veloso and more). Jherek’s BPA appearance will include a mixture of tunes from his record “Composed” as well as music that he was commissioned to write by Lincoln Center for the Kronos Quartet, and some ambient chamber music he composed last year. Check it out: Jherek is thrilled to join the Kronos Quartet in a performance (of his commissioned work) at the Lincoln Center on July 28 as part of their Out of Doors festival. Watch this video to learn how Jherek’s Island background helped shape him and his music, and listen to his interview with Terry Gross on Fresh Air here. Visit Jherek online.